One of the most common reasons students choose to attend one of the 112 California community colleges is to earn an associates degree that will enable them to transfer to a four year institution for a bachelors. In fact, making the transition from one of the California community colleges to a four year university is much easier than starting at a four year university as a freshman. California wants to keep their community college graduates in-state, so they created the A Degree With a Guarantee program. This joint transfer program makes moving from an associates to a bachelors easier in California than ever before. Here’s how it works. Students earn either an Associates of Arts that will transfer (AA-T) or an Associates of Science that will transfer (AS-T) at a California community college and then are guaranteed to be admitted to the California State University (CSU) system. 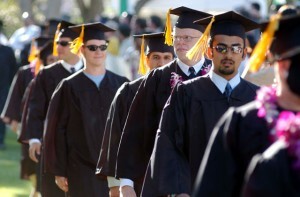 They will normally be admitted with junior standing and only have to complete roughly sixty more units to graduate. Most common degrees – from an associates in Administration of Justice to an associates in Theater Arts – will transfer. There are 23 CSU campuses that accept these transfer degrees. An associates degree from a California community college is valued by any four year university, but it makes sense to stay in-state at one of the CSU campuses. You’ll get great value for your money at one of the best academic institutions in the world. Arguably the most difficult transition to college life is during the first two years, and if you transfer to a four year university from a community college you’ve already done that. At a community college, you learned in smaller classes and got a lot of individual attention. Now you’re ready to for the demanding junior and senior level classes in your major. At a community college, you learned how to live more independently, but you were still close to home. Now, you’re ready for a bigger campus environment. Also, by going to one of the California community colleges you saved a lot of tuition money. In fact, many four year university freshman and sophomores take introductory classes at the local community college because they’re cheaper. All that money you saved will come in handy at the big university! Once you’re at a four year university, you’ll quickly relax. The campus may be bigger than what you’re used to, but you’ll soon see that your community college experience has prepared you well.